If you’re looking for an easy way to guarantee the perfect turkey for holiday celebration, our detailed turkey fryer reviews will help you pick the fryer that will guarantee a perfectly cooked, moist turkey every time. In recent years, frying that Thanksgiving and Christmas turkey has become a favorite way to prepare those holiday birds to guarantee a great result. If you want to try deep frying that holiday bird or other large piece of meat, we’ve collected our choices of the best turkey fryers that have the best features, are extremely popular, and have the best reviews so you’ll get the best bang for your buck. While traditional deep fryers require you cook your turkey outside, this specially designed Masterbuilt Butterball turkey fryer offers the convenience of cooking inside while still delivering a perfectly cooked, moist turkey. It’s a great convenience to be able to get a perfectly cooked turkey without having to watch an outdoor fryer. This fryer also cooks the turkey up quickly and to a nice crispy finish. Turkey has crispy skin, although users do state that only the part of the turkey’s skin that is covered in oil gets crispy. Imagine frying without any kind of oil? That is exactly what you can do using the Char-Broil Big Easy Oil Less Turkey Fryer. Char-Broil patented infrared cooking technology prevents flare ups and eliminates hot and cold spots when cooking your turkey. Cooks Turkey’s up to 16 pounds as well as other large cuts of meat. Reviews for the Big Easy Oil less turkey fryer are exceptionally good with most users really liking this fryer and loving the fact that they don’t have to buy expensive peanut oil or risk hot oil overflowing the fryer. While users do stay that this fryer needs to be outdoors and protected from the breeze due to the open flame. Other than this one caution users find the following benefits. This fryer allows you to collect drippings from the juice of the turkey to make gravy to go with your turkey dinner. 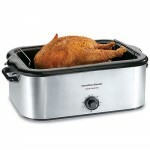 The Masterbuilt 20100809 Butterball Oil-Free Electric turkey fryer and roaster is great for people who are enjoy the flavor of smoky meat. 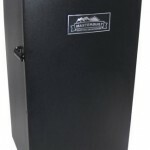 The built in wood chip box is handy for smoking all types of meats making this fryer/roaster extremely versatile. If you are looking for a different way to cook that holiday turkey or other large cuts of meat, then one of these turkey fryers may be worth considering.